When creating and executing a campaign for a nonprofit organization, it can seem slightly overwhelming to make a difference when there is so much "noise" on social media. We're here to help with tips on how you can execute a successful social media campaign for nonprofits. With the #GivingTuesdayCLT campaign, hashtags were used to distinguish the campaign from other Giving Tuesday campaigns. 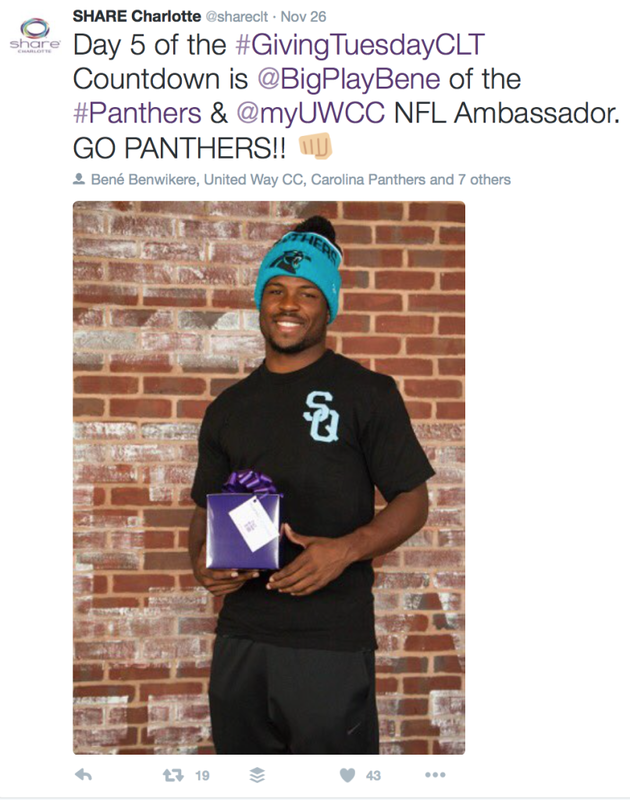 SHARE Charlotte used #whatsyourgift, #getyourgiveon, and #GivingTuesdayCLT when referring to the campaign through social media. This was a great way to get people talking and for our team to keep track of the buzz. 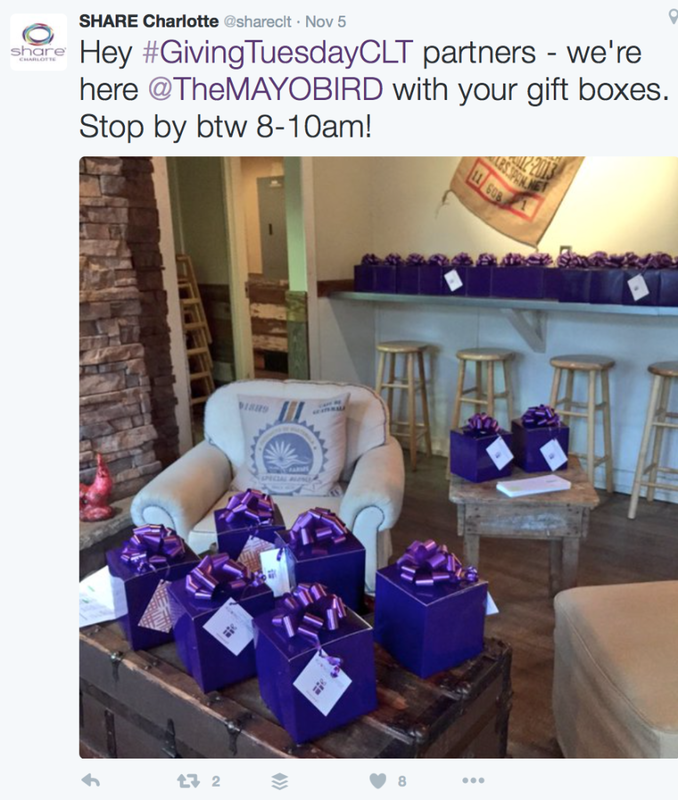 Along with the hashtags, SHARE Charlotte used a purple gift box as the symbol representing the campaign. With these we were able to promote the campaign organically throughout the community by asking those involved to tweet and post using the hashtags and symbols. This is probably the most important part of a nonprofit campaign. By getting the community involved, you're building an advertising campaign without having to fork out a lot of money. We did this by creating a Charlotte celebrity countdown within the community. We asked several influential people in the Charlotte community to take a photo holding the #GivingTuesdayCLT purple gift box in a creative way and then we used those photos to count down until the official #GivingTuesdayCLT day. This campaign worked as a chain reaction by getting all the followers of these local celebrities to stand behind the campaign. Similar to having local celebrities involved in the campaign, it’s a great idea to reach out to the social media influencers that have a large social media following to get involved. With a large following and being very active on social media, these individuals can reach more people organically and authentically by posting to their own social media channels showing their support of the campaign. We sent our Social Media Influencers a SHARE Charlotte bracelet as a genuine invitation to join the team as well as give them a physical piece to use in photos. This may seem like a given, but sometimes it can get really overwhelming working towards a large goal. Don’t forget to enjoy the journey because that will show in your social media efforts AND help you to have good memories of a job well done! Be personable and engaging and this will show through in your campaign. Older PostWe're Hiring an Intern!